Ben Aquila's blog: More adults identifying as LGBT in U.S.
About 10 million Americans, or 4.6 percent of the U.S. population, identified as LGBT in 2016. A new Gallup poll released the findings, the portion of American adults identifying as lesbian, gay, bisexual or transgender increased to 4.1% in 2016 from 3.5% in 2012. To determine these numbers, pollsters conducted interviews with random sample of 1.6 million U.S. adults (over age 18) for the past five years, asking, "Do you, personally, identify as lesbian, gay, bisexual or transgender?" Nearly 50,000 responded in the affirmative. Young people born between 1980-1998 were twice as likely as other age demographics to identify as LGBT. 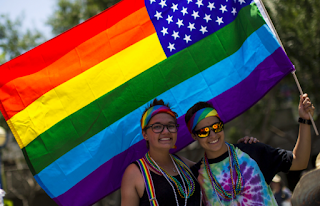 Although they account for only 32 percent of the adult population, millennials comprised 58 percent of the total number of self-identified LGBT Americans, and they grow up from 5.8% in 2012 to 7.3% in 2016. In addition, women (4.4 percent) were more likely than men (3.7 percent) to identify as LGBT; the former group also accounted for a greater increase since 2012. In terms of race and ethnicity, polled demographics were white (3.6 percent), black (4.6 percent), Hispanic (5.4 percent), Asian (4.9 percent), and other (6.3 percent). See the full report on Gallup.com. Becca Kellstrom liked this post, thanks so much!